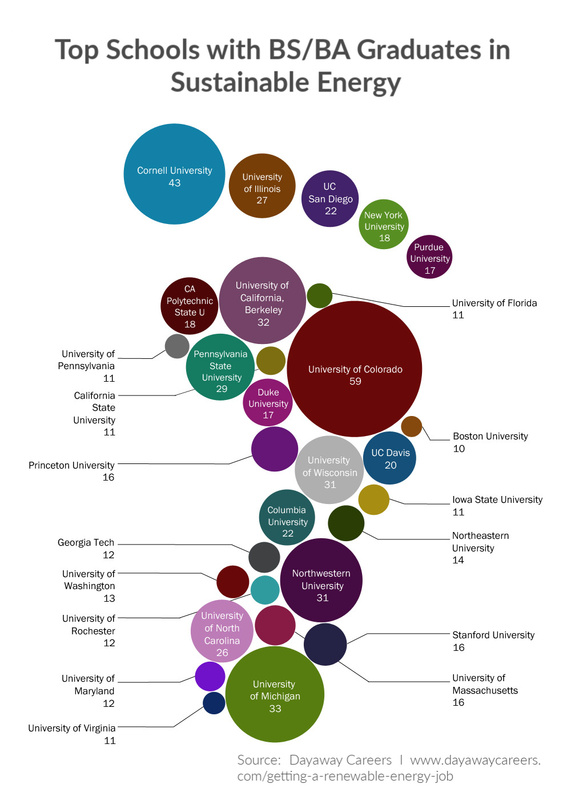 We analyzed 1800+ BS/BA graduates working in sustainable energy to identify their Alma Maters. The infographic below shows the top schools. The data represents 2010-2017 graduates working in sustainable energy at companies that (a) produce sustainable energy (e.g., solar, wind, bioenergy, etc.) or (b) provide products and services that help us use energy more sustainably (e.g., electric cars, energy-efficiency, smart-grid, etc.). Some companies are pure-plays (Tesla, Sunpower), others have a divisional focus (GE Renewables, Navigant Consulting). Each person may or may not have a graduate degree (MS/MA, MBA, PhD); we’ll provide that data later. Is the data statistically unbiased? Probably not. But does it provide insight? We think it does as it shows that so many of the country’s great schools are placing their graduates into sustainable energy careers – tomorrow’s energy professionals. Special thanks to Tiffany from Cal Irvine for the great infographic!